On our beach trip Anna and Didi (our friend) made these adorable stick people. Didi is a artist and art educator. She is AWESOME! and Anna loves her and especially loves doing art projects with her. Since I knew Didi was going to be at the beach, I picked up a few art supplies to bring with us. These little popsicle stick people were so cute I couldn't resist buying them. I thought they would make really fun little puppets. They used the model magic and molded it to make the hair. 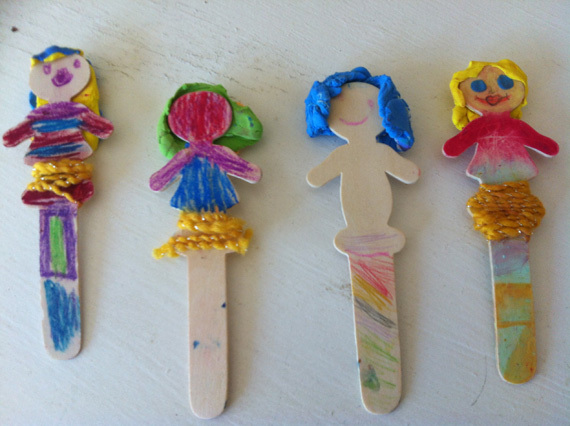 They used glue and yarn to make the clothing and they decorated the rest of the sticks with oil pastels. I couldn't believe how cute they turned out. Even though Addie didn't make any of these, she sure enjoyed carrying them around and playing with them!